Successfully Added Tactical LED Flashlight with Red Laser Sight (Picatinny Rail Mount, Dual Switch) to your Shopping Cart. 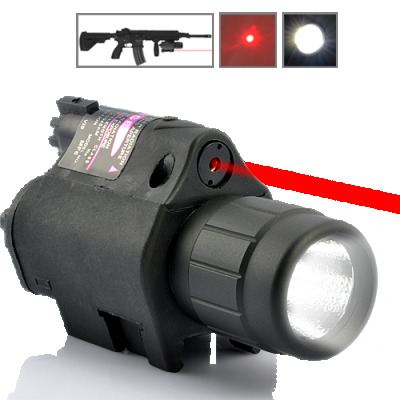 Tactical LED Flashlight with Red Laser Sight for you to simultaneously illuminate and aim the target under low light conditions. This 2-in-1 tactical flashlight and laser sight set can mount on rifles, shotguns and other firearms with Picatinny Rail Mount. It comes with a mode selector for various operation modes, such as flashlight only, laser sight only, and flashlight/laser sight at the same time. The flashlight and laser can also be easily turned on and off by either using the constant on button or a tail line pressure pad. The Flashlight provides 176 lumens light output, bright enough for any action at dark nights. Better yet, the laser sight is fully adjustable for Windage and Elevation (with the included Allen Wrench) for you to make that critical shot accurate and deadly. Whether you are Law Enforcement professionals, hunters, or civilians protecting your home and family, you can equip your weapons with this little accessory to provide you with extra confidence and accuracy. Also suitable for reselling on your online store to make some extra profits. Order yours today and it will get shipped tomorrow. From your reliable source for cool electronic gadgets, Chinavasion. While it’s recommended to use with rifles, this laser sight can also be used on other weapon that have a Picatinny Rail Mount. If you are looking for a gun sight specifically for lighter weapons (pistols, revolvers, etc), please check out our CVKW-G336.